This one won’t seem a big deal, however those who use Smartlist and Excel day-in day-out would agree with me that it’s a pain to see numbers getting exported as string from Smartlist to the Excel. We had to then format the column as either number/currency and then continue with our analysis. With this FOTD, we are gonna save time. No frustrations either. With GP2016, we can export amounts from Smartlist as numbers to Excel. In my opinion, this is not a new feature. This should be categorised as an improvement. I am glad that all these small nitty-gritty details are coming through well with each release. Mark Polino of DynamicAccounting.Net has released first among series of Excel Dashboards, Sales Analytics Starter Edition, for Dynamics GP. 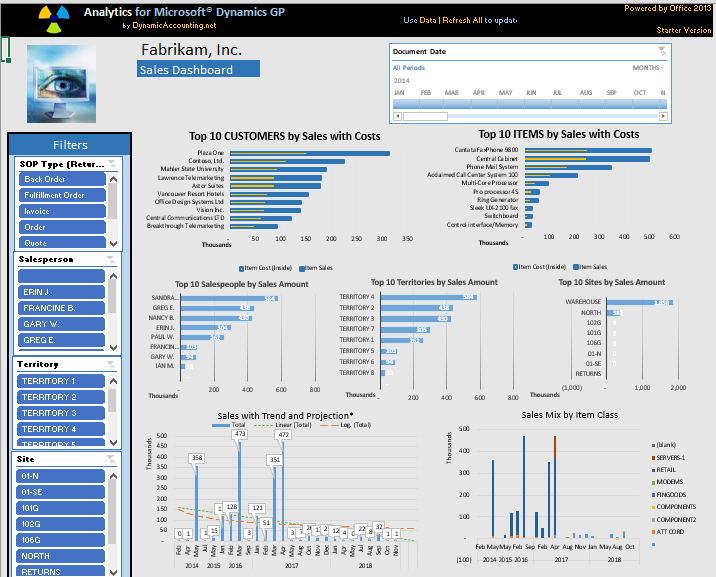 This dashboard series is named as Analytics For Dynamics GP. It’s a simple plug and play kind of dashboard on Microsoft Excel (v2010 & v2013) file. Setting this up once you buy it is so very easy. How to map your GP data server is clearly explained as part of this dashboard solution. And you can modify this as you wish once you link this to your GP data server. As it is just an Excel file with a straightforward GP data server connection, all you need to do is to click on refresh to get the real time information. This sales dashboard starter edition is priced at $249 +$49 annual maintenance. Maintenance covers updates, improvements and fixes. Click on links provided across this post to visit Mark’s Analytics For Dynamics GP product page, learn more about this awesome BI solution and know how to buy your copy. In my personal opinion, this is a simplistic and satisfactory BI solution which meet its promises pretty well. Don’t be harsh on me of being so ignorant. But this concept is one thing which I never learned it quite right. One of my colleagues, Nasir, used to teach me this wonderful VLOOKUP concept and I always got it wrong. Today I decided to get it right once for all. Stumbled across this video, Brainstorm’s VLOOKUP Tutorial Video, which is available directly from MS Excel Help Links. This is exactly what Nasir also explained me, but somehow I missed something in this entire process. Thanks for his patience and thanks to this video. I thought I would create a pointer to this Easy to Understand Video, for those out there who are struggling (like me till today) to understand this concept.